"Where but in fandom would you find a national epic - a work of heroic proportion - that contained such drama, such explication of achievement and inspiration, temptation and redemption, pathos, struggle, tragedy. and The Holy Grail, along with useful tips on avoiding overinking?" 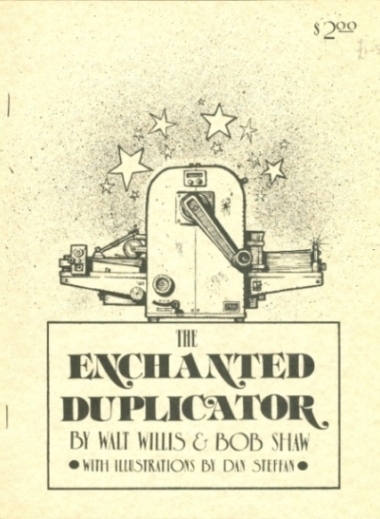 First published in February 1954, Walt Willis and Bob Shaw's THE ENCHANTED DUPLICATOR relates the allegorical tale of Jophan's quest to find the Enchanted Duplicator so that he can publish the perfect fanzine. Scrabo Tower in their native Northern Ireland was how they visualised the Tower of the Enchanted Duplicator. "Bob Shaw wrote most of Chapter 5 and 6, part of 7, and the first para of 17, but the idea itself is a much closer collaboration. It arose out of a conversation two years ago about a radio play by Louis MacNeice based on the quotation 'Childe Roland to the Dark Tower Came'. We kicked the idea around for a whole evening, ending with a pageful of notes. I wrote the first four chapters almost immediately and passed them on to Bob. That was the end of it for more than a year. Then when Vince was over last September we had a discussion about the sad state of Fandom at the time -- at that period Seventh Fandom was howling alone in the wilderness - and put TED high on the list of Projects to promote a fannish revival. Like the new Hyphen and Toto. George Charters offered to cut the stencils, and every Tuesday afternoon I'd scribble a chapter or so in the office, type it out at teatime, and given it to George that evening. At one time I thought I'd never get it finished, because new ideas kept coming to mind more rapidly than the story progressed to a conclusion, and finally I'm afraid I cut it short too abruptly. There was to have been an Ultimate Temptation, science fiction itself, but I found it difficult to symbolise the exact shade of action representing the True Fan attitude to sf; and there was difficulty or plain impatience - I was no longer quite so enthusiastic, having lived with the thing for eighteen months - I just brought it to a close with that purple passage. Which I felt quite uneasy about at the time as perhaps having gone too far." - Walt Willis letter to Redd Boggs, March 1954. "James White and I had been a partnership, Bob Shaw made us a group. We had been a couple of dedicated fuggheads toiling away at hand printing SLANT three nights a week. Gradually, insidiously, Bob changed all that and we became the fannish fun-loving group we've remained ever since. We became less productive but more creative, like Bob himself. Bob is a sort of fan's fan: he's not one of the really prominent names in general fandom, but he's had more influence on those who are than a dozen noisier BNFs He's the sort of person who's always throwing out brilliant ideas and losing interest in them when they reach the stage when something actually requires to be done. 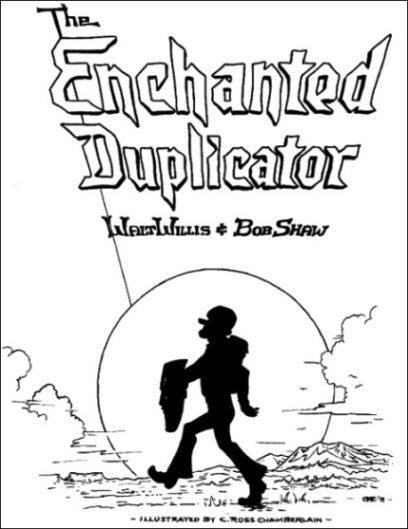 Like The Enchanted Duplicator for instance. 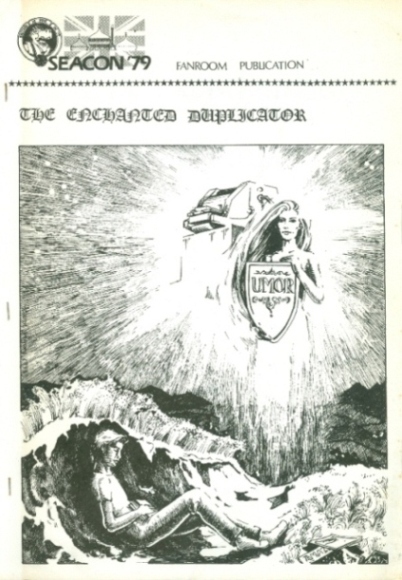 One evening, it came out that we'd all been listening to a radio play by Louis McNeice called "The Dark Tower" and the whole idea of The Enchanted Duplicator sprang full-fledged from his mind there and then, including the famous ending. I fell for it like a ton of bricks and the evening passed in a whirl of ideas, Bob finally leaving with a solemn promise to start work on it rightaway. But days passed and then weeks and then months and he'd still only produced a couple of hand-written pages, so I started and wrote it all myself, incorporating Bob's MS as parts of Chapters 5 and 6. More ideas kept coming to me as I wrote it and it could have been twice as long except that I began to worry lest it might be getting tedious - it was so easy to write, once I'd got the style, and writing has never been easy for me before or since. But it looks as if I needn't have worried, because it turned out to be a fantastic success. I don't think there can ever have been a fannish project which was received so exactly as the authors had hoped. One extraordinary result of its success was that it took years to sell out. People reading the reviews assumed there must be no copies left and some even advertised for it without bothering to ask us. We only printed 200 copies but we had a dozen or so left until somebody (Ted Johnstone I think) noticed that the copy I sent him was No.176 and publicised the fact. It's out of print now all right, but Ella Parker of London plans to republish it this year. Pierre Versins meant to publish a French translation, which I'd love to have seen, but at his request I sent him an explanation of all the esoteric puns and allusions in it and I'm afraid he got discouraged. 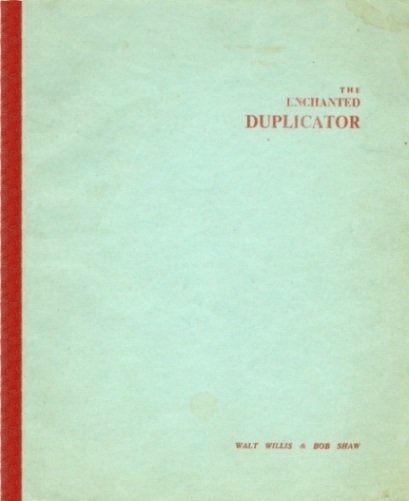 I don't see why: Willy Ley translated Jabberwocky into German and Valery Larbaud Finnegans Wake into French, so a little thing like The Enchanted Duplicator should have been a cinch. In case you haven't read it, it's an allegory of a fan discovering fandom from the fan sections of second-rate prozines ('the cornfield') and determining to publish a fanzine himself. On his way all the things we disapproved of in fandom were pilloried, including our own former selves (The Letterpress Railroad), the London Circle (The Circle of Lassitude) and even actual fans like Ed Wood (Dedwood of, the City of Serious Constructivism). Everybody said it was modelled after Pilgrim's Progress and I suppose it was, though in fact neither Bob nor I had ever read Bunyan's oneshot. 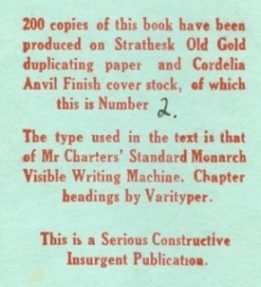 At the last moment I had the idea of printing a sort of colophon on the back, mainly for some place to number the copies without having to open them, and on the spur of the monent, composing on the stick, I added "This Is A Serious Constructive Insurgent Publication." As far as I know nobody mentioned those words from that day to this, until Eney featured "Serious Constructive Insurgentism" as a regular recognised fannish movement in his FANCYCLOPEDIA II. I was surprised, but on thinking it over I realised that he was right. Nobody may ever have used those actual words, but they expressed well enough the attitude of the group of fans which was the nucleus of Sixth Fandom. We didn't have any delusions about fandom being more than a ghoddam hobby, as Burbee put it, but we didn't have the sneering misanthropic Laney attitude either. If we'd had a slogan it would have been Ashworth's "Fandom is a damn good hobby." "Most people who like to write will have had the uneasy experience of looking back on something they wrote years before and realising that they couldn't do it again. When this had happened to me a few times I jumped to the obvious and depressing conclusion that whatever powers I may once have had were deserting me with the speed of a glass of Whitbread disappearing down Ian McAulay's throat. I seemed to be gravitating along the ladder of success. The Enchanted Duplicator changed all that, I'm glad to say. Looking back on my share of it I feel that I couldn't do it again, in fact I don't feel any sense of authorship at all. This was what led me to realise that if you get inspiration and produce something with it, it is only to be expected that you could never do the same again. You have had your say, and the subject is closed. I hope the above paragraphs will explain why this foreword contains no penetrating insights into TED, and no fresh thoughts on the theme. It was the Bob Shaw of many years ago who took part in the project, and the Bob Shaw of today reads the finished work merely as a bystander. I think that the parts Walt Willis wrote are better that the parts I did, but I derive a lot of quiet egoboo from the fact that nobody has been able to delineate our separate contributions." - Bob Shaw, Second Edition, 1962. 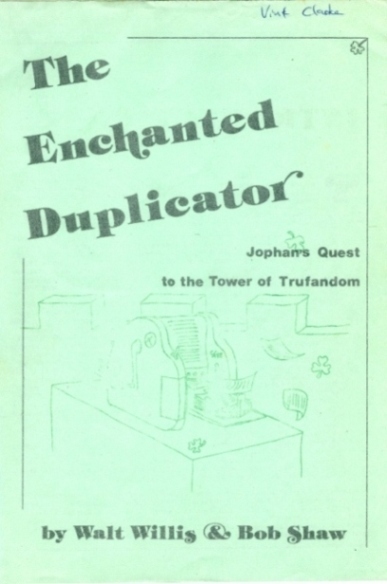 "The Enchanted Duplicator was received by fandom with such awe-inspiring enthusiasm that it must obviously have filled some deep-felt want for a new basis for our hobby, now that our former proselytising zeal for science fiction no longer seemed to make sense. More surprisingly it was warmly welcomed by people like Ken Slater and the new generation of serious-constructive fans in the North whose attitude it had criticised by implication." - Walt Willis in SCOTTISHE #38, ed. Ethel Lindsay, February 1965. Ella Parker's suggestion that she would like to reprint TED never got any further so far as I'm aware, but we did almost get different third and fifth editions to the ones we ended up with. To say I was completely knocked out would be an understatement... TED was just so *clever*, so apt, yet it rang so true! As I read about Jophan travelling through the Canyon of Criticism, I thought "Yes, that's right, that's me!" and I realised that what I had needed all along was a good, reliable, Shield of Umor. The fan with the Kollektinbug on his back was Cliff (Teague), surely, and the Circle of Lassitude was a perfect description of the Brum Group. But I worried, was the Sercon City *really* where I wanted to spend the rest of my days? It was a true masterpiece, and yet it was something of which I had only been vaguely aware. It ought to be required reading for every new fanzine editor. Why wasn't it more generally available? My copy was from the second edition, number 133 out of 150, published in 1962 by California fan Ted Johnstone, with illos cut directly on stencil by Eddie Jones, and it was already out-of-print. "A reprint", I thought, "What a fine fannish project that would be." With illustrations by Arthur Thomson, of course, who was the natural artist for something like this. But Arthur was in the United States on his TAFF trip, attending the 1964 Worldcon in Los Angeles. It would have to wait until he came back. I found an answer to my lack of time by asking Doreen Parker to type the stencils, which she did so quickly and efficiently, although repeating one of the interlineations several times in the process, Doreen was so good that I asked if she would also cut stencils for my new edition of THE ENCHANTED DUPLICATOR. I sent Doreen a photostat copy and she agreed to bring the completed stencils to the Easter Brumcon, and Arthur Thomson could take it from there. Eventually the Tri-con party broke up and fans drifted away. Just before I left, however, Doreen Parker appeared with a large black cardboard folder. "They're the stencils for THE ENCHANTED DUPLICATOR," she said. "I wanted to make sure you had them in case I don't see you tomorrow." I thanked Doreen for all the work she had put in and offered to buy her a drink. We didn't want to stay in the fast-emptying room, however, nor go down to the gloomy and overpriced hotel bar, so we went off the find the room parties, which began early that night. Next morning a blizzard was raging outside the windows and this accentuated the sense of finality, the realisation that the con was over, as fans paid their bills and departed. Belatedly, I remembered the stencils Doreen had given me the night before and which I'd carelessly put down in the room party. I checked, but they weren't there, asked at the desk and was assured I would be contacted if they were found. By this time I was a bit worried but I was sure they would eventually turn up. After all, it was pretty obvious what they were and surely no harm would come to them. What had happened to my poor stencils? They hadn't been handed in, to either the hotel or the convention committee. After a couple of days I had a feeling of sick certainty that they weren't going to turn up, now, and all Doreen's work had been for nothing. 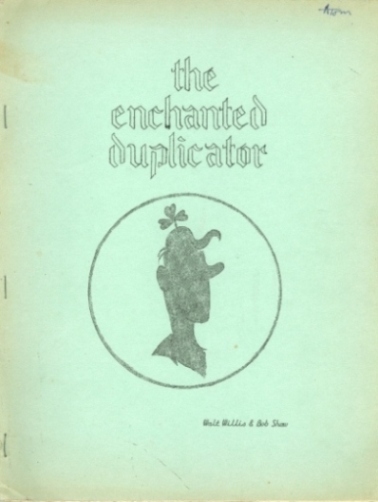 Someone had taken them and there wasn't going to be a new edition of THE ENCHANTED DUPLICATOR, not unless we started all over again. I owe Charles Platt an apology. Evidently he didn't steal my stencils, though Graham Hall told me he did. Funny how truth has a way of coming out, isn't it? That, incidentally, was my biggest grievance and to find the stencils were destroyed not through plain enmity but by a non-entity for no good reason is even more hurtful, somehow; anyone who thinks that kind of vandalism is funny just isn't my kind of fan. About 1975 or 1976 I had the idea of reprinting it after it had appeared in AMAZING. I got permission from Bob Shaw. Andrew Stephenson did a wonderful set of illustrations, each in the style of famous pro artists. But when I saw the title page he'd done the author was just Bob Shaw. I queried this with Bob and he insisted that Walt Willis had had very little input and wanted only his name on it. Whilst trying to unravel this surprise info, I read that he'd also given Eve Harvey permission to reprint. He then claimed to have completely forgotten about giving me permission and had no idea why he'd wanted only his name on it. So it never got published by me." All very odd. Had Bob claimed TED was all his idea that would agree with one of the two versions of events Willis gives above, but prior to this I'm not aware of either ever claiming sole authorship. If the drawings done for this edition come to light I hope to feature them here in future.